MANILA, Philippines - Gilas Pilipinas Head Coach Chot Reyes is obviously ecstatic for the 2023 FIBA Basketball World Cup which will be hosted in our homeland together with co-hosts Japan and Indonesia. Coach Reyes can’t contain his excitement as he revealed his future roster on Friday morning, January 5, 2017. 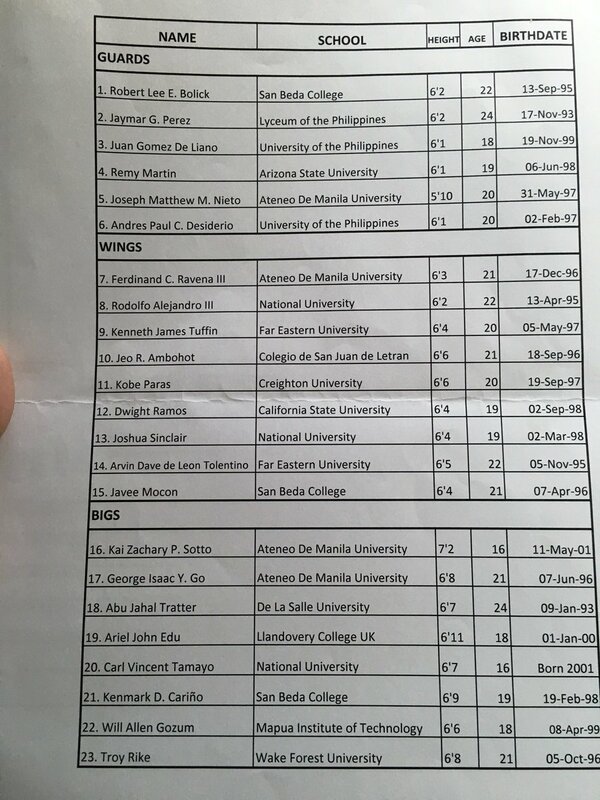 In his tweet, the long-time Filipino basketball mentor publicly shared a long list of local and Fil-foreign players bannered by UAAP, NCAA PH and NCAA US young guns. Among the standouts are future twin towers and seven-footers Kai Sotto and Fil-Nigerian AJ Edu. Last year’s collegiate finals protagonists Thirdy Ravena, Matt Nieto, Isaac Go, Abu Tratter, Robert Bolick, CJ Perez, JV Mocon, also made Coach Chot’s wishlist together with other superstars Juan Gomez De Liano, Paul Desiderio, Rodolfo Alejandro III, Kenneth Tuffin, Jeo Ambohot, Josh Sinclair, Arvin Tolentino, Carl Tamayo, Ken Carino, and Will Gozum. High-leaping wingman Kobe Paras from Cal State Northridge along with Fil-Ams Remy Martin from Arizona State University and Wake Forest University’s Troy Rike complete Coach Reyes’ 23-man roster for the 2023 World Cup. Coach Chot expressed his intention to recruit youthful and promising cagers since he took over the helm of the national team program from Coach Tab Baldwin to prepare for the future international tournaments. Reyes is also eyeing for a young reinforcement in preparation for the departure of Andray Blatche whose contract with Gilas Pilipinas is expiring very soon. 7-foot Isaiah Austin who backed-up Chooks To Go Gilas Pilipinas in FIBA Asia Champions Cup last year is being considered by Chot Reyes and SBP to replace NBA veteran and naturalized-Filipino Andray Blatche. But, as per Coach Reyes, nothing is final as of the moment. With this potential line-up, Philippines is having a good chance to regain its basketball supremacy in Asia and hopefully, in global scene.